Since 2010 Our mission is to provide a safe, secure, environmentally responsible solution to the dilemma of proper disposal of old computer systems, components and electronic waste (e-waste). Beyond Surplus offers a convenient, secure, and affordable way to get rid of obsolete electronics that may be taking up space in your closet, garage, office, or warehouse. At the Beyond Surplus Recycling Warehouse in Smyrna you can safely recycle your old computer systems, monitors, fax machines, printers, servers, IT Equipment, and other peripherals items and much more. Is there a fee for Atlanta computer recycling? No. Does your business have a large quantity of business grade enterprise level it equipment? A large volume of Laptops, servers, computers, switches, routers etc? Contact us about our profit sharing programs for this type of equipment. Request a free, no obligation, Valuation to find out the value of your company’s computer equipment. Beyond Surplus handles every step of the disposal of your old equipment on a profit sharing basis or offering you a straight buy out. Beyond Surplus provides electronics recycling services to a wide range of clients throughout the United States including Government Agencies, Healthcare Providers, Schools, Universities, Data Centers, Wholesalers, Distributors, Corporations, Retailers, and Residential Customers that have trusted us to recycle their unwanted equipment for years because our services are not only free, but exceptionally convenient. Beyond Surplus will ensure that your electronics are recycled appropriately in accordance with all local, state & federals laws. Unlike other recycling companies, we do not export any of our equipment outside the U.S., ensuring that your used computers will never end up in a landfill or improperly discarded. By recycling your obsolete electronics, you are doing your part to protect the environment and ensuring the reuse of valuable resources. Recycling of obsolete IT assets, laptops, computers, servers, routers, switches, AC Drives, Industrial equipment, Office equipment, telecom and data center equipment. All can be done at Zero Cost (Free) & For Higher value equipment you can make some money back through our Profit Sharing program. When making the decision to recycle unwanted PCs, data security and privacy is extremely important. Even a non-functional PC, Laptop, DVR or Copier still has a hard drive full of data inside it. In this time of constant threats to data security, protecting your confidential information is one of the highest priorities for all companies. Beyond Surplus can assist in securing your data on retired assets. Every hard drive and storage media that is brought to us is wiped using a Department of Defense Compliant erasure program free of charge (This takes several hours depending on the size). All hard drives & storage devices deemed to be non-functional will be shredded or otherwise physically destroyed at no cost to the customer as part of our data security guarantee, we will email you a Certificate of Recycling & Data Destruction with our guarantee that your data has been destroyed upon request at no cost. We offer free pick-up for equipment from businesses within 50 miles of the Atlanta Metro Area including Atlanta, Sandy Springs, Roswell, Alpharetta, Marietta, Kennesaw, Dunwoody and help arrange transportation nationwide. There is no need to stockpile your old electronics like desktop computers, fax machines, toner cartridges, ink cartridges, laser printers, inkjet printers, toner cartridges, IT recycling, servers, routers, phones, laptops, networking equipment, switches, telecom equipment, mobile phones and batteries when Beyond Surplus will recycle them. We also make arrangements to use our own equipment, our small but mighty fleet of trucks and or a transportation partner to facilitate pick-up and delivery. Beyond Surplus will provide the labor to move and palletize the equipment on site and deliver to its warehouse if necessary. Keep your business running smoothly. Beyond Surplus specializes in the safe & secure disposal of your obsolete computer & electronic equipment. We offer computer recycling and disposal services to the fortune 1000, small businesses, colleges, and school districts. We offer custom solutions for your company’s eWaste disposal needs. 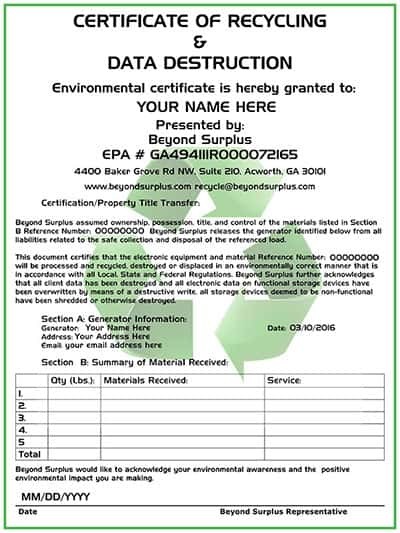 When you choose Beyond Surplus for asset management solutions you will have the option to receive a Certificate of Recycling & Data Destruction and a basic inventory list to include only the quantity and type of each item at no cost, we also offer for a nominal fee serialized reporting on all assets. Our asset management packet is emailed after all the equipment has been processed at our warehouse and includes, Inventory list and a Certificate of Recycling and Data Destruction. Each packet is issued a project number making tracking and compliance easy. Send us your old components, and we’ll wipe your hard drive beyond any possible recovery, send you a Certificate of Destruction with a Beyond Surplus guarantee, and responsibly recycle the hardware. The Beyond Surplus guarantee ensures all intellectual property and the associated physical materials are disposed of in a secure, environmentally responsible manner. We specialize in the recycling of complete systems to individual components, let Beyond Surplus take care of your hardware and information disposal needs. Where can I find Free electronics recycling near me?